Charitable Rust 2016: Over $17,000 Raised! 11/26 @ 8:50am EST - The guys over at xtab donated their cut of the Charitable Rust 2016 shirts, putting us well over the $17k mark... awesome! Updated some numbers below accordingly. 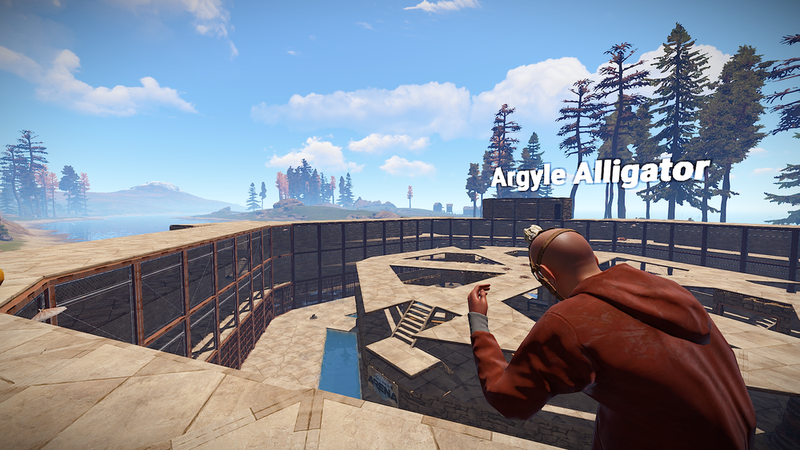 11/24 @ 3:00pm EST - The update is out and devblog is live! Gobble Gobble! Caves are coming back next week! 11/22 @ 4:30pm EST - The final numbers just came in… Charitable Rust 2016 raised over $16,000 for Doctors Without Borders - blowing our original goal of $5,000 out of the water by over 3 fold! I am so moved and honored by the support of the community, this was an astonishing event. Our original goal of $5,000 was upped to $10,000 only 90 minutes into the event because it became clear, we were playing a bigger game. We then surpassed the $10k mark before the event officially ended. That, coupled with $5340 in sales of the Charitable Rust 2016 shirt, put us over $17,000 raised for Doctors Without Borders! $6,675 in Charitable Rust shirt sales! 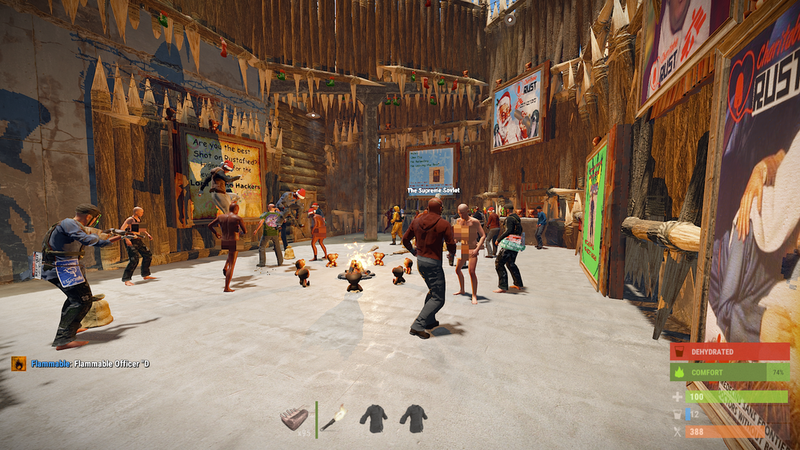 A huge thank you to Garry, the entire team at Facepunch, the crew over at xtab studios, and everyone who purchased a Charitable Rust 2016 shirt. In less than a week of being on the store, it generated over $6,000 towards the cause! I’d like to acknowledge our single biggest individual donor of the day: Grimmfang. Throughout the day, he donated 7 times, totalling $2,020! Thank you to Grimmfang and the entire Cuda87 family - you guys really set the tone for the day, causing us to double our original goal, and helping us more than triple it! This year was without a doubt a star studded affair! Thank you to every celebrity guest who showed up, including Tank Girl, DOA, Argyle Alligator, Cuda87, Ser Winter, Trausi, Shadowfrax, Bizzlesnaff, Partially Royal, MrMemio, Vertiigo, KCmo, Dean Central, Bumbo, Frankie, Holdacious, Helk, Alistair, Holmzy, and everyone else! You all helped attract a huge audience and filled the day with awesome event after awesome event. A special thank you goes out to every Rustafied VIP. It’s the VIP program which keeps Rustafied operating and growing, without it we would not have the presence and servers which we do. I’ve been squirreling away some of the proceeds and, on behalf of you all, Rustafied donated $1,410 during this event! This years event was huge, and it took literally hundreds of hours to set up the server, prizes, invites, and everything else which went into the production. From the bottom of my heart, thank you to the entire team which helped out. There are way too many of you to name, but you know who you are, and I love you all! These acknowledgement posts are always difficult, especially with such a large event. So many people helped us reach (and triple) our goal, it is simply impossible to adequately acknowledge everyone. To all of you who donated, watched the stream, spread the word about the event, or participated in any way - I thank you. If I missed a special mention to someone in particular, I apologize, and please know that I am forever grateful for what you did. A huge shout out to Mr. Mars for winning the Charitable Rust 2016 art contest - and the $50 steam gift card to boot - with his exquisite rendition of Tank Girl and Vertiigo. He is one very talented dude, go follow and support him! Special mention also goes out to Banana Cognac and Fawn for being finalists in the contest, and thank you to every artist who participated this year, there were some really excellent (and some not so excellent) entries! Check some out here.